I would say that if I was to pick a single game for people to play in a structured way to understand a lot about strategy. Here’s, actually I’ll probably surprise a lot of you people here, and say they can probably just do well with rock paper scissors, in a sense that a lot of games have representational issues of how realistic or generalizable they are, and at the core a lot of strategy amounts to making choices about what to do without knowing what your opponent will do, and the game that’s one of the most atomic and basic in the way it represents that is rock paper scissors. But not just a one off game, a finite game, if you play repeated games of rock paper scissors, the way people win is by detecting sequential dependencies in the various choices that their opponent makes – so learning about the opponent over time, particularly their choices of what they’re going to field, is a very useful heuristic, is a very useful educational gesture..
Adam has more to say about rock paper scissors at his Zenpundit post, Master and (Drone) Commander? The advantage of asymmetric games lies in the ability to build nontransitive or triangular relationships into the game. Transitivity is a well-defined mathematical property. In the context of games it is best illustrated with the rock-scissors-paper game. Two players play this game; each secretly selects one of the three pieces; they simultaneously announce and compare their choices. If both made the same choice the result is a draw and the game is repeated. If they make different choices, then rock breaks scissors, scissors cut paper, and paper enfolds rock. This relationship, in which each component can defeat one other and can be defeated by one other, is a nontransitive relationship; the fact that rock beats scissors and scissors beat paper does not mean that rock beats paper. Notice that this particular nontransitive relationship only produces clean results with three components. This is because each component only relates to two other components; it beats one and loses to the other. 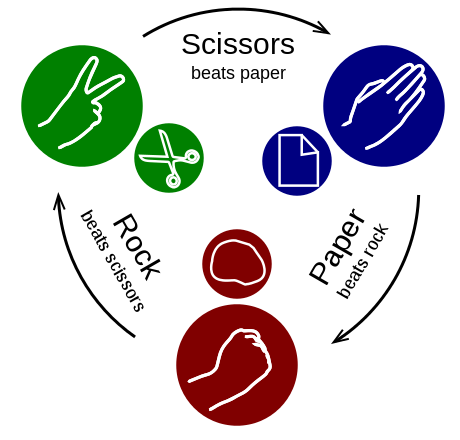 A rock-scissors-paper game with binary outcomes (win or lose) cannot be made with more than three components. One could be made with multiple components if several levels of victory (using a point system, perhaps) were admitted. John Robb on The Future of Drone Warfare is worth conasidering here, too, and play nicely with more of Adam’s thoughts in the podcast. See also my post, Of games III: Rock, Paper, Tank. And I think I’d best stop here, and make a second post on rock-scissors-paper and threeness games in general. This entry was posted on Friday, October 30th, 2015 at 4:32 am	and is filed under adam elkus, Charles Cameron, counterintuitive, games, john robb, strategy, Uncategorized. You can follow any responses to this entry through the RSS 2.0 feed. Both comments and pings are currently closed.